Once you have created a Custom Confirmation Email. You can set it to entire Pay-Per-View Playlist. This is especially great if you manage multiple clients Pay-Per-View Playlists and need to send separate Custom Confirmation emails depending on the clients Pay-Per-View Playlist that purchases are being made from. If you want to learn how to set and specific Pay-Per-View videos to use a specific Custom Confirmation Email rather than entire Playlists. Go to our tutorial here ->. If you want to check out some Pay-Per-View Demos and extra information please visit our Pay-Per-View information page. 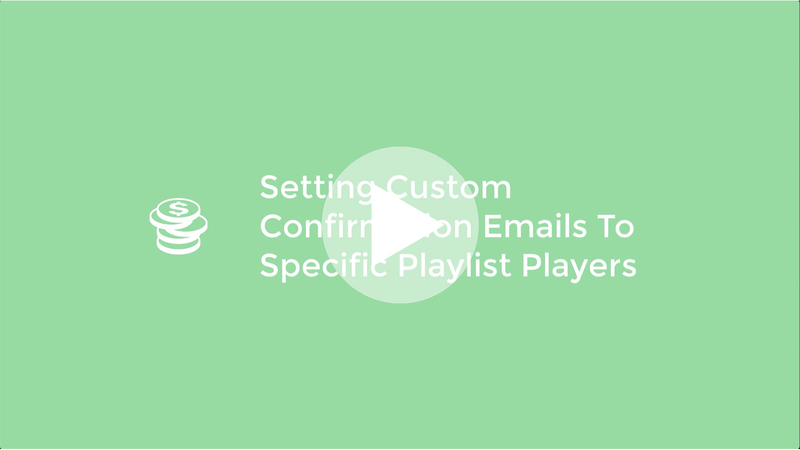 You can also set an entire Pay-Per-View Playlist to use your preferred Custom Confirmation Email which will change all Pay-Per-View ticket sales within the playlist to use your chosen Custom Confirmation Email. To set a Custom Confirmation Email to all Pay-Per-View Videos within a Playlist simply click onto the Playlist button in your Media Section. Select the Playlist you would like to edit. With the Playlist selected click on the Monetize tab in the settings bar. Under Custom Confirmation Email you can simply select your desired Custom Confirmation Email from the drop down menu. This will open a popup information box asking you if you want to change the current Confirmation Email to your newly chosen one. Here you get the opportunity to revise any affected media by clicking on the Summary buttons. If you are happy with the changes you made, simply click on the green Confirm button to apply the desired changes. You have now set your chosen Custom Confirmation Email to your desired Pay-Per-View Playlist.